I’ll admit, I bought toffee for YEARS. I mean, melted sugar is like LAVA; isn’t that dangerous? Isn’t it going to be a pain to clean? Nah. Turns out it’s easy, you don’t need many ingredients and it cleans in a snap. Who knew? So below you’ll find my toffee recipe. It’s as advertised, buttery and delicious! 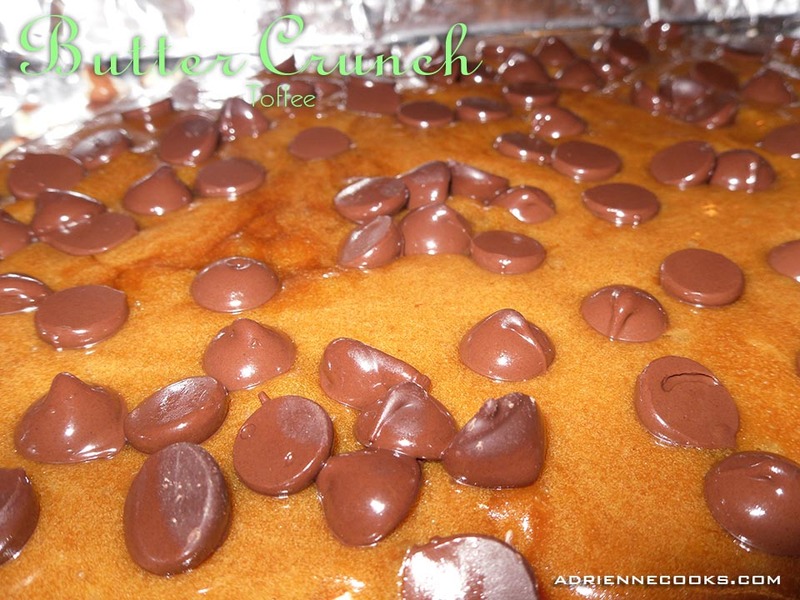 Buttery Toffee: Preheat oven to 350 degrees. Toast almonds in a skillet or on a baking sheet till fragrant, about 10 minutes (medium on stove top, 350 in oven). Cool almond and coarsely chop. Use half the nuts by spreading on the bottom of a buttered sheet pan, 10×13 is perfect, or use a large pan and cluster the nuts in the center in a single layer. Save the other half for the topping! 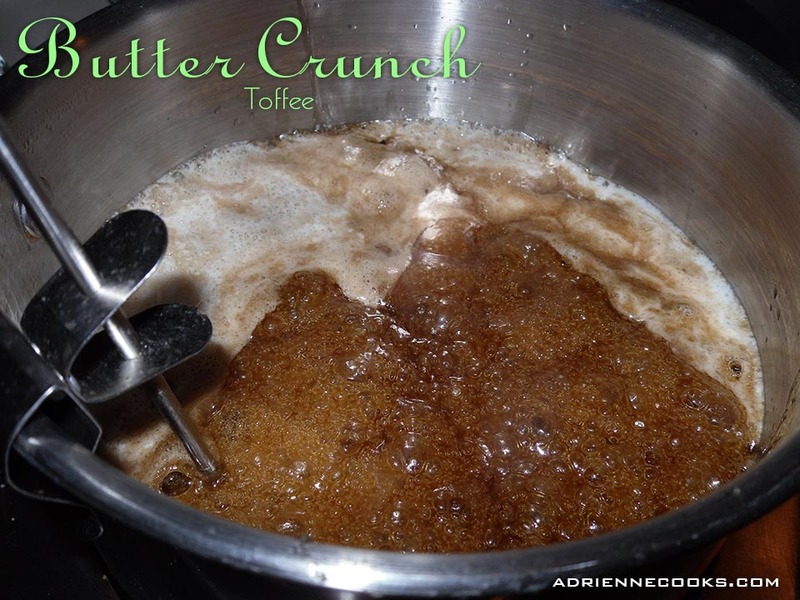 In a medium, heavy pot combine the brown sugar, water, butter, and corn syrup. Get your baking soda and vanilla extract ready. Seriously, have them ready! Sugar heats quickly and can go from perfect to burned in a big darn hurry! Bring the mix to a boil, stirring to dissolve the sugar – I usually don’t go over medium-high heat. Then cover the pan with a lid for about a minute. Why so short? Do I really need to do this? YES! It lets the mix “Sweat” little beads of water on to the sides which “washes” them back down into the melted sugar. Errant sugar still in its crystal form and cause the mix to re-crystalize and get grainy if they fall in later in the process. After removing the cover, put a candy thermometer in the mixture, making sure it isn’t resting on the bottom. Use the kind with the clamp on the side – you can’t hold it the whole time over hot-lava-sugar – you will steam your hand! Now leave it alone and let it cook, no stirring, until it reaches 285 degrees. This is called “soft crack” – your thermometer might tell you as much. I suggest watching it – not just letting the new-fangled thermometers beep at you when at 285 because the temp will CONTINUE to rise. Remove from the heat at 280 – it will still rise to 290 which is what we want. When it OFF THE HEAT reaches 290 add the baking soda and vanilla extract and stir. 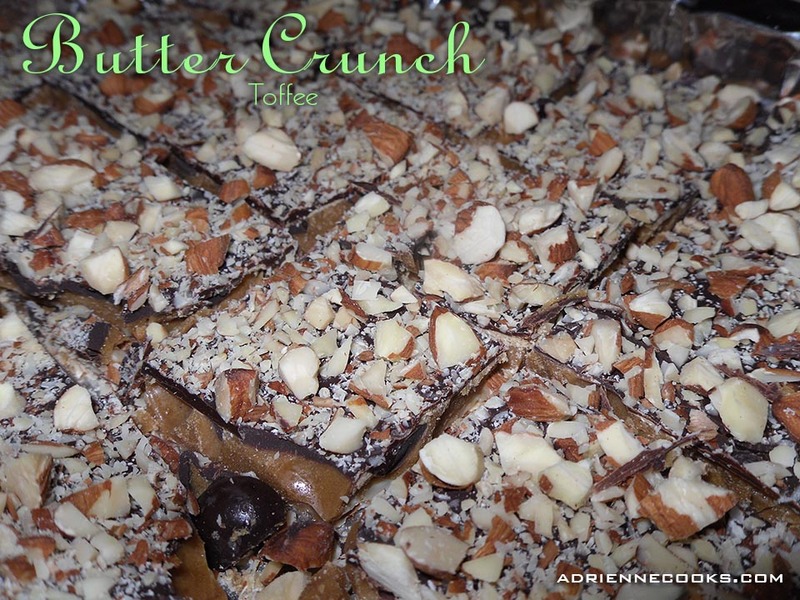 Pour your liquid toffee over the nuts on the baking sheet. Sprinkle your chocolate chips over the top – do not touch! It’s still REALLY hot. Leave for 5 minutes and then spread the chocolate with a spatula. Then sprinkle with your left over almonds. Now refrigerate for 30 minutes and you are ready to go! Break it up or cut and eat. If you can manage to keep any around, you can store in a plastic or glass container with a tight lid in the fridge for about two weeks. It might help to separate layers with waxed paper. I’ve never had any left… so I don’t know! ← Chicken and Sausage Gumbo, N’awlins in a bowl! Chocolate Pudding (Shhh with avocado!) Low-Carb and gluten free!